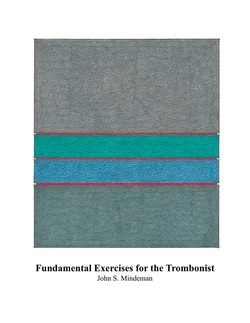 Fundamental Exercises for the Trombonist is a book written for the aspiring trombone player. It is designed to provide trombonists with a collection of exercises and etudes that can help improve many aspects of basic trombone technique. Establishing a basic daily routine - a daily focus on the “building blocks” of technique - is vital for improvement and maturing as a trombonist, as well as for maintaining one’s technique. This volume provides in one place a wide variety of materials the trombonist can draw upon to create an effective personal daily routine. 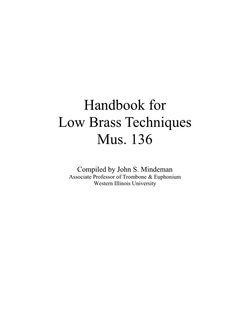 Handbook for Low Brass Techniques is essentially a textbook for the Music 136 class at the Western Illinois University School of Music. It deals with the basic "how to's" of learning to play trombone, baritone or euphonium, and tuba. It contains exercises for instruction and practice, as well as information regarding proper playing technique, and a discussion of the history and literature of the instruments. You can access this book here. Here are some interesting, educational, and helpful websites that will help you in your development as a player, your knowledge of the repertoire, and in becoming more aware of what's going on in the trombone world. www.rkingmusic.com Sheet music supplier and publisher Robert King - a treasure trove!